The Hampshire Avon rises in the Vale of Pewsey to the north of Salisbury and then flows south where it confluences with the Dorset Stour in Christchurch Harbour. A significant proportion of the water in the catchment is from groundwater within the chalk aquifers underlying two thirds of the upper catchment. At Salisbury, the Avon is joined by three of its major tributaries - the Rivers Bourne, Nadder and Wylye, and a short distance downstream by the River Ebble. They support habitats and species of national and international importance, which is reflected in their designation as Sites of Special Scientific Interest (SSSI), Special Area of Conservation (SAC) and Special Protection Areas (SPA). The water supports a variety of different uses: public water supply, industry and recreation for fishing and other pastimes. The total catchment area is approximately 1,750 square kilometres, with 205 kilometres of river designated as SSSI. 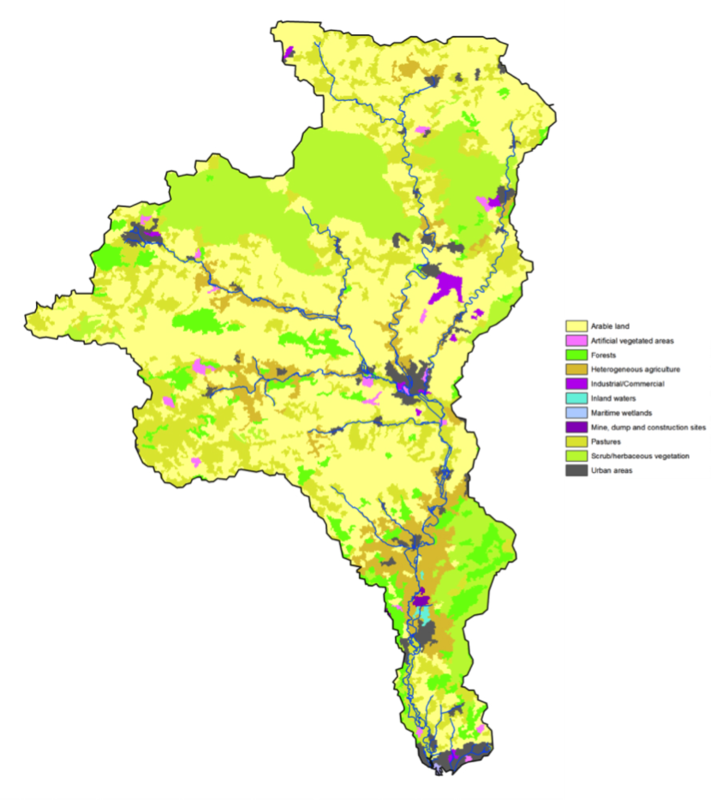 The catchment is dominated by chalk which underlies 70% to 80% of the north of the catchment and comprises large, mostly unconfined, aquifers that provide the majority of flow to the rivers, as well as providing public water supply for the catchment and the surrounding area. To the south of Downton the chalk plunges below sands, clays and gravels, which significantly affects the natural characteristics of the many streams and small rivers that drain into the Lower Avon river. The water and flow characteristics of the catchment dominated by the permeable upper catchment geology. Fast flowing chalk streams emerge from the chalk aquifer, which underlies the majority of the upper catchment, providing a stable flow of calcareous rich alkaline water that influences the rich biota of the river and provides the majority of public water supply for the upper catchment towns. There are a number of winterbournes within the catchment such as the River Bourne, which flows for 35km in winter, but only 9km in summer. In contrast the Nadder, Upper Wylye and the Headwaters of the Avon are underlain by greensand, which gives these catchments a greater surface water dominated input. The Hampshire Avon catchment is characterised by open chalk downlands with steep valley sides, sheltered valleys, chalk hills and ridges. Variations in the topography have a strong influence on the rivers’ response to rainfall. The Upper Avon catchment is typified by undulating chalk downlands on Salisbury Plain, which are cut by steep combes and river valleys. The lower catchment is characterised by rolling farmland and the New Forest. The main watercourses have wide floodplains and flow through farmland, woodland, scrub and open heathland. 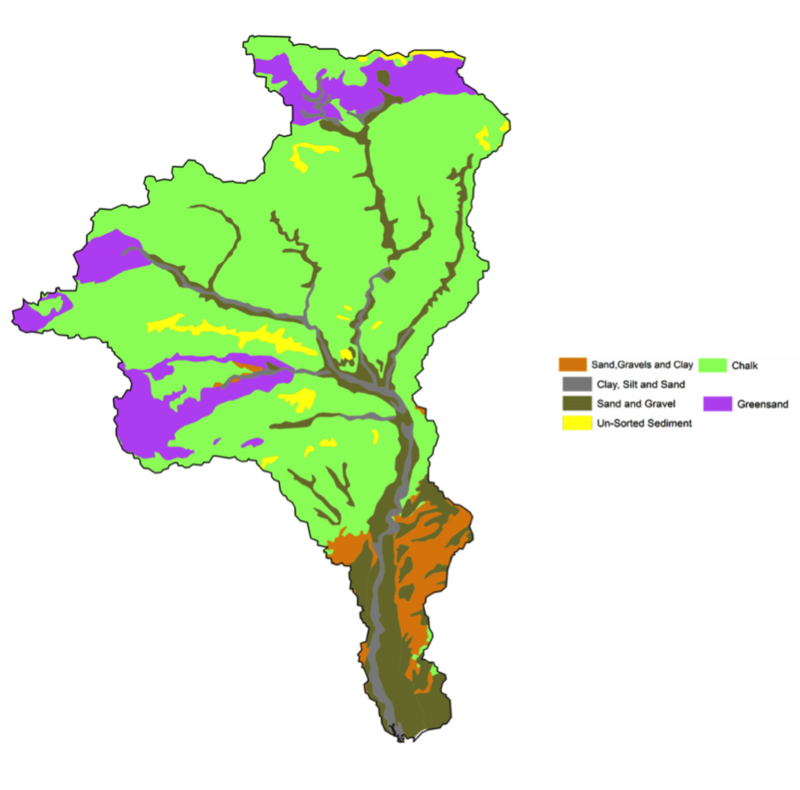 The greatest delivery of fine sediments entering the river system is from the upper catchments of the Wylye, Nadder and Avon due to the predominance of greensand geology and its high erosion risk as a substrate. This risk coupled with the development of widespread arable cultivation in the catchments, with large areas of former grassland ploughed up for Arable farming, has led to serious soil erosion on autumn cultivated riparian land, especially after heavy rainfall. The River Avon and its tributaries have been shaped and influenced by a long history of human use. The rivers have been engineered since the time of the Romans with the construction of mills and water meadows, which significantly influenced their current form. These historic uses of water for milling and pasture management - whilst no longer active in many places - continue to influence the management of the Avon through the many structural remains and water diversions. This rich history of land management is integral to the landscape, heritage, social and economic value of the river. 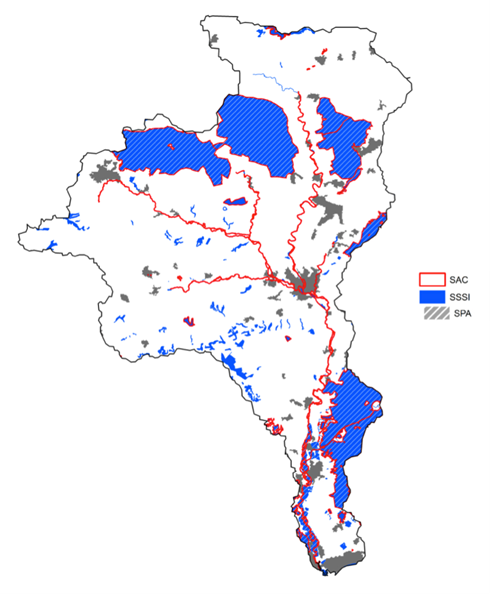 The Hampshire Avon catchment has a population of around 230,000, but only two per cent of the catchment is urbanised. 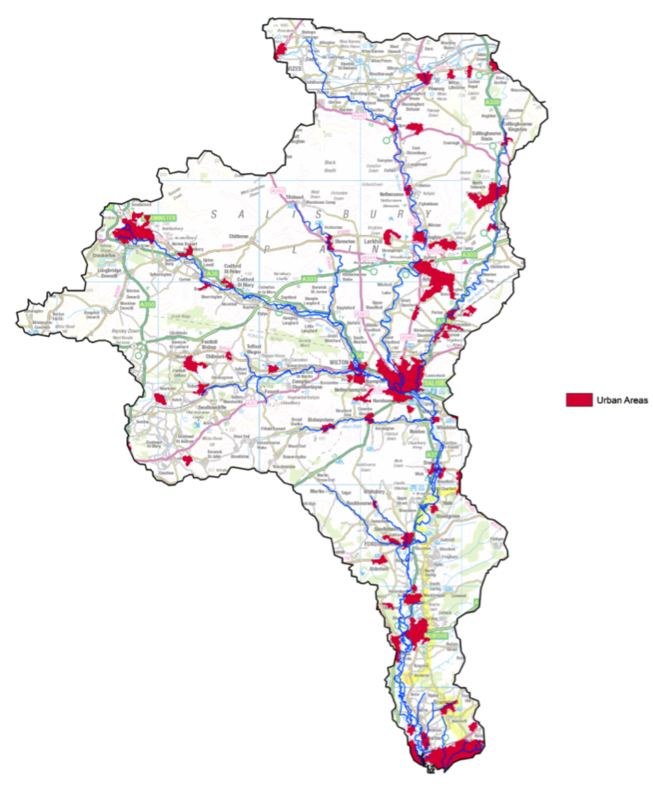 As well as Salisbury and Christchurch, the urban areas include Warminster and Ringwood. In conservation terms the River Avon is one of the most important river systems in the UK, supporting internationally and nationally important assemblages of both habitats and species. 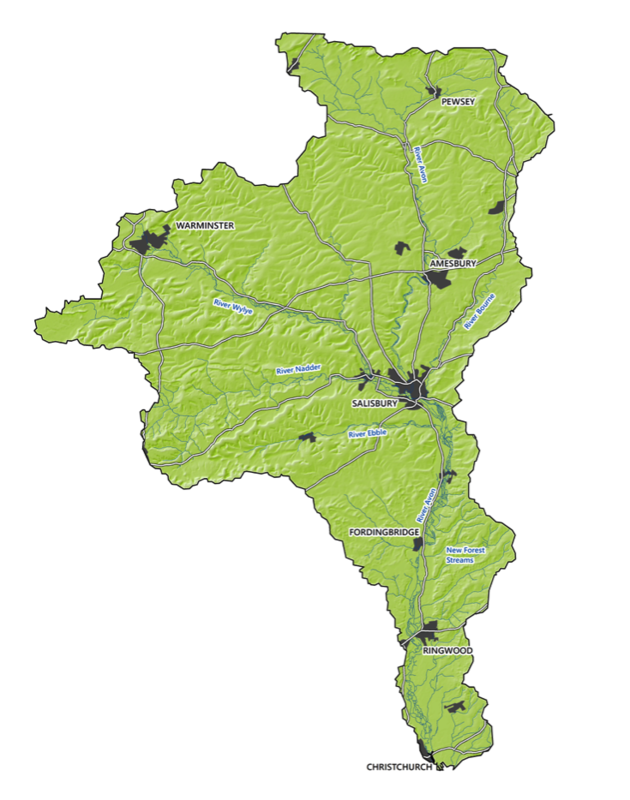 Within the catchment there are a number of sites designated for their environmental importance including two Areas of Outstanding Natural Beauty, two Environmentally Sensitive Areas, nine Special Areas of Conservation (SAC), six National Nature Reserves, 71 Sites of Special Scientific Interest (SSSIs) and 1,061 Scheduled Monuments. Both the River Avon System and River Till are designated internationally through the Habitats Directive as an SAC. These SACs support internationally rare and threatened species. The river itself is designated as the River Avon System SSSI covering the River Avon, its major tributaries and parts of the floodplain. The River Till, a tributary of the River Wylye and Christchurch Harbour are also designated as separate SSSI units. The lower reaches of the River Avon and its floodplain, one of the largest expanses of unimproved floodplain grazing marsh in Britain, are designated as the Avon Valley SSSI (Bickton to Christchurch) and Special Protection Area. It supports a complex mosaic of wetland habitats including fens, mires, wet grassland, wet woodland and unimproved floodplain grassland. Important species include populations of breeding and over-wintering wetland birds and rare wetland plants and insects. The species diversity of the catchment is one of the greatest in the county and includes many records of nationally rare and scarce species and those listed as priority species in the UK Biodiversity Action Plan. With over 180 species of river plant, one of the most diverse fish populations in Britain and a wide range of river invertebrates the river system is richer and more varied than most rivers in the UK. Habitats associated with the river include swamp, wet woodland and wet grassland habitats. In addition, the River Ebble is designated as a wild fish protection zone, which looks to increase protection of key nursery areas for wild stocks of trout and salmon and reduce potential risk of genetic damage to wild fish stocks. Please visit the Hampshire Avon Catchment Partnership website to find out more.